As a metaphor, the word Cave represents the Mind. Fire or a flame represents creation energies linked to the sun or source. To move through a cave, labyrinth , or the like, is to move through the consciousness grids that create the holographic illusion of our reality. In the 21st Century we remain in the eternal paradigm of healing to understand the nature of reality as a hologram set in time to experience emotions. The 'Cave of Fire' marks the beginning steps of going beyond regular emotional states of self awareness. The ritualizing of human evolutionary process is older than when our forebears crawled out of the primal waters. It has over time set itself into our cultures, philosophies and human traditions. This paradigm has surfaced and intertwined itself through human traditions such as Shamanism, or anyone of the many obeah practices that are prevalent in our many different cultures. Druidism, Whirling Dervishes, Buddhist monks, Cloisters and the many other lamasery practiced have taught the steps necessary to allow for personal growth and awareness through certain established edicts in order to raise the level of human awareness and consciousness. Religion, in it's own system has been the more accessible criterion available to the masses. All cultures have known that a process outside the physical is essential to complete the total human evolutionary process. It is not by thinking, alone that we achieve this. Spiritual precepts, metaphysics, sorcery, magic, and all forms of divination are the beginning (if one knows how to use them) instructions to take us further along the transformation than human reasoning could take us, but very few people had access to this knowledge on a mass scale. Most of the arcane knowledge was kept secret (more human power control struggles) from us ordinary folk, so the inner levels were kept guarded and not explored generally, by the mass populations. The invention of the printing press was secondly the most effective discovery in human history. It made available knowledge and information on a larger scale. Whereas up until then only a certain selected few and those in power, who controlled the amount of arcane knowledge it's interpretation were privy to the higher knowledge. Information was now free at last. Industrialization was in full swing and for the first time skilled labor was allowing people some free time from the shackles and drudgery of survival. Up until then, agriculture was the prevalent means of economy. As you might surmise, 12 hours in the fields plowing, planting and harvesting doesn't leave you a whole lot of time for reading, and exploring the inner planes. More thinking sciences were now becoming available by the turn of the century. Psychology, which became a part of the human process, in the last century, has also contributed to the availability of similar human experiences. It helped inform the mass populace that many inner level experiences were "normal". The everyday folk could now, begin the inner exploration. The emotional highway was about to be surveyed and mapped. Carl Jung was one of the first to introduce the idea of 'archetypes', which has become the established paradigm for existing analysis of conscious awakening process. He was one of the first to go past the stayed psychology of Freudian "sexual repressed desires" theorem, into the blending of physical and spiritual catharsis. He knew that the way to reach the level of pure awareness was through the emotions and that once the last layers of human reactionary process became neutralized into spiritual balance that then and only then could we as a species rise above the baser, dense energy of the emotional imbalances to reach our full potential. The 'Cave of Fire' marks the beginning steps of going beyond regular emotional states of self awareness. It establishes the course of how we move forward in our development. All great masters have gone their journey have made their way through this paradigm of human evolutionary purification. These transformations are a keystones to consciousness and the process of awareness for all human DNA - even Christ and Buddha passed through these processes on their way to Enlightenment. Jesus, the Christ icon, spent 40 days and nights in the desert in the many stages of purification process, of removing himself from the desires and wants of the emotional and physical plane. It was there that he confronted the "devil" of denser human emotional needs. As we know from, religious scriptures and history he did succeed in going beyond the human emotional awareness of physical consciousness and made it through to Super Consciousness, eventually after years more of purification and processing. The 'Caves of Fire' are just the beginning of the spiritual process of emotional, earth plane manifestation through purification. Buddha also went through the 'Caves of Fire' as the beginning of his purification. It is that place where the Self is met. Where we meet the illusion of the established ego based Self that usually governs our thoughts and actions. It is the first steps in the purifying of the Kundalini energy - not opening but purifying. Opening can happened any where along the scale even prematurely without any control. It can happen in dream state or waking state. What I am speaking of here is the purification process. Purification of the human emotional, mental, physical bodies goes through the channel of the chakras. The chakras are the wheels of energy that hold the energy source to the different levels. These "cone" vortexes are the energy exchangers, they are switches that allow us to reach higher levels of clarity. The frequency of these depends on our experiences from past lives, and current thoughts and actions. We have to purify these through the Kundalini. In order to be able to control our Kundalini, we must master a certain discipline of balances in our thoughts and actions. If we create negative energy then the vortex will not be able to "switch" us to higher pathways of awareness. It will just spin in a holding pattern "collecting" more negative energy. The Kundalini is an amazing source of energy it's frequency is exceptionally high. If any one of the sheath bodies is not properly prepared it can cause severe damage. Even the physical body has been known to combust!! The degree of energy is that much! Function: Survival issues, physical vitality, creative expression and abundance issues. It is interesting to note that the bladder is an emotional alarm point as well as the spine. If we are having constant manifestation of disease, there, then we are probably still at fear base with survival do to many possible causes. The Root Chakra is the seat of the Kundalini. 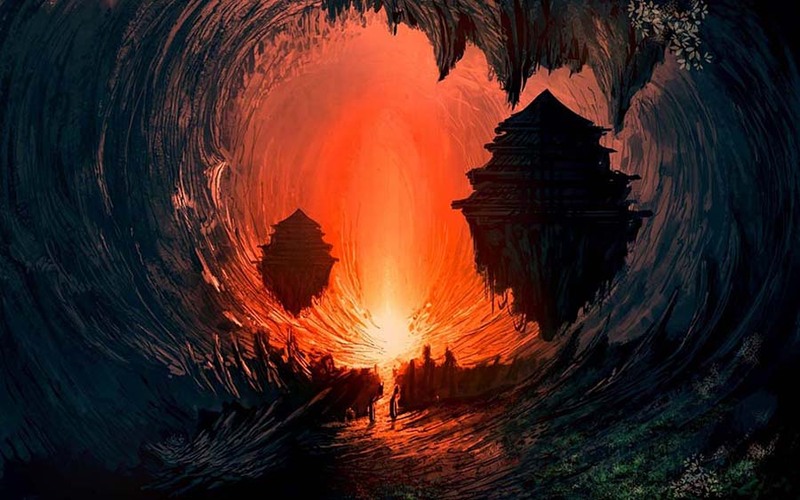 The Caves of Fire are the purification that, when we are ready, allows us to open up to resolving these and moves us toward the next step of transformation to total awareness. Because we are exposed to the Caves of Fire does not mean we automatically pass and have succeed in the process. It is a opportunity not a guarantee. It isn't that one fails one if simple not ready, their frequency is not high enough. There is no such thing as failure - merely not ready yet to "let go" of old emotional, mental and ego based thoughts and actions. I do not even suggest that I am in the category of Buddha or Jesus The Christ - please - I am not even there - I still like my electronic gadgets!! Ah, attachment - guess I still have to work on that one, huh?? (smile) I only used them as an example to show you that we can all have the opportunity and that they too were human. They had to process no differently that we - they just took the process to it's fullest completion. My opportunity at the Caves of Fire came at a time when my spiritual studies were progressing at a phenomenally rate. I had for 7 years crossed over from traditional psychic, metaphysical, religious studies to learning how to soul travel with a master on the earth plane and continued to do so when he passed over. I was pregnant at the time and had been confined to bed rest the last three months. An angel kept constant vigil in my bedroom - and stayed with me until the completion of the birth, though he is never far from me at any time. However, if I am ever in life threatening situations, he does return and will stay with me until the danger passes. I can't begin to tell you how many times I have been in danger and the sight and feel of his spiritual frequency was the source of immediate comfort and knowing. He came in with me when I was born, instructed me until young adulthood, until I was ready to go on and complete my spiritual path. Your spiritual path is something, that, ultimately, you must do alone., You can have help, and guidance, from an angel, master, a guide, or even another human, who has come here to help, but it is you who, in the end, must evolve. In this particular case I was faced with two danger zones. My body was having a difficult time carrying full term. I was never suppose to have children - a bit of information my family didn't tell me till I was in the second trimester with my second child!! The second danger was the house I was living in. It was a gateway to the Holding Area for the Astral Plane. One of many vortexes or gateways available. This was my cousins' house. I have written other articles explaining his experiences with the entities who would pass through --humorous and scary. I'm sure it was of no coincidence that my cousin came to buy the house or that the fact my husband and I were living on the ground floor. One of the inhabitants passing through had tried to kill me ( buy strangulation) one night in the week proceeding my even knowing I was pregnant. Apparently he knew. Still I was holding my own - but the constant incarceration in the latter months of the pregnancy left me unable to totally use all my abilities - it had weaken my physical body as it took great strength to balance the forces of the house. The energy surges were potential dangerous more so to my baby rather than I. It was all the houses energies that was giving the problem. The angel came sat in the room next to my bed and never left not even when I was taken to the hospital. In fact the angel was at the hospital with me. It was a touch and go labor - 2 days!! OY!! The life of my baby and my life were in great peril. I knew it though no one had said a word yet. At one point during the labor I saw the angel's look - his energy told me the entire story - I knew we both were going to die unless I had some help. I told the doctor if you do not help me, now, my baby and I will not make this. He just looked at me!! No, one had told me yet the trouble we were in. The doctors had just had the meeting themselves - he was coming to talk to me. I was immediately rushed into the O/R. Then finally I gave birth!! We were going to be okay! It was the 48 hours after giving birth that I was presented with, 'The Caves of Fire'. I had been brought back from being in recovery and intensive care for 24 hours. I had awakened and ate my first meal. I was feeling okay considering what I had been through. I decided to meditate. I meditate differently than some schools teach in westerns cultures. I don't use meditation to ask for anything - I use it as it was meant to be used - or being still. For listening, for, Being. Now, understand I had no idea where I was or what was about to happen. It wasn't till some 3 years later that I was reading ancient scriptures in the library that I started reading about, 'The Caves of Fire'. It is a transformation, for those who make the leap, to the next level toward fuller awareness. It purifies from the core base of emotions so for those, who process successfully, are able to go beyond base emotional issues to higher planes of processing. To say the least it is a place where we are confronted with core issues - and the participants in the cave can be any of the people in our lives. This is the place of pure raw emotional energy. It is the animal base. It is very dense, and uncomfortable in the caves. The "floor" on which you walk is in resonance to your spiritual ability and capacity. As soon as you become frightened or fear base at anything you see, hear, smell, touch - all 5 senses are tested for imbalance, the floor will drop out underneath you. Leaving you to fall into the fire! Was I frightened? Are you serious??!! My heart was in my mouth! When I realized I wasn't in my hospital bed anymore - uh,oh, we aren't in Kansas anymore Todo!! - I was very disoriented. I was frightened, but I knew that in the moments of worse fear that is the time one should still themselves, because it is the fear that causes us imbalances and prevents us from using our full spiritual awareness. I centered myself immediately. I walked and moved through each situation. As I responded in an open and accepting way, each horrible image or person dissolved. The floor stayed intact as I waked forward. I could see "pookas" or holes all over an around me, but I was okay everything stayed underneath me. You are offered many things in the caves, like power, money, fame, sexual situations - all of it is an opportunity to see if you truly need any of these things. What is being looked at there is not the THINGS but the reasons for why you want them or still need them. All it really means that if you need anything and accept any of these things - then more work is still necessary before you can move on. You see, the soul truly doesn't emotionally NEED anything. The soul is complete. Needing is an emotional base activity. It means there are attachments or crutches in use. These attachments apply to the positive aspects of emotions as well - not just greed, hate, or anger, jealousy, etc. One can be attached to loving, or giving , or to a person even. There are so many subtle nuances of emotional attachments. The soul, loves, shares, gives UNCONDITIONALLY without any pay back - including feeling good off of doing something good. Feeling good can become a crutch. It means we are not doing it for the reason of doing it with out getting something in return - that is an attachment. If this is the case then we truly are not giving - we are taking! If you accept anything because of attachment - the 'Trail By Fire' stops immediately! It's over. You will then have to wait again for another time to be "tested". It may takes years before the opportunity arrives again - for some - if they don't keep working on their spiritual path in earnest---will not be offered another chance during that current lifetime---but a chance will come again at some time in the many incarnations ahead. Please, remember you are never judged, or reprimanded, or looked badly upon. A true spiritually balanced path has none of these. It is merely an opportunity to move a ahead through transmuting of spiritual energy. Believe me, you can't con it, you can't cheat it you can't pretend or lip service it. It knows Spiritually Energy is Aware. It has Consciousness. It is Unconditional Love to it's full degree. Human awareness and reasoning is very limited in it's capacity to discern. There is a much larger picture than we can perceive at our limited level of earthly awareness. I passed through, 'The Caves of Fire' and was returned to my bed at the hospital. I was never so happy to see a hospital room!! (smile) It took a while for me to begin the feel the affects of the transformation as I fell right to sleep shortly after returning. The nurse came in several hours later and asked me if I wanted any pain medicine. I realized - I had no pain! Absolutely none. It was the side effect of 'The Caves of Fire' transformation. I had achieved the ability to transmute small amounts of pain. After 3 days of refusing meds, the nurse got concerned, she thought I had nerve damage. She told doctor tested me. I was in perfect health! He asked me why I was refusing meds as I should be in a lot of pain. I told him simply, "Doc, I don't take medicine if I don't need. I'm not in any pain." He just looked totally confused. Well, it wasn't the first time I baffled the medical profession and believe me, it wasn't going to be the last either. It was a beautiful time - such peace. I lay there feeding my new baby and felt completely whole. All was in synch . I moved on in spiritual growth and awareness in leaps and bounds. Each day brought something new and wondrous to work with - I look at adversity as not a thing to hate or dislike - I look at it as an opportunity for me to move closer to Full Actualization. To complete having to create the need that creates so much karma in any situation. I learn to "let go" of any ties to any situation - that single act allows me to have clarity in anything I am doing. Select music for your journey if guided. Find a position that is comfortable for you. Your legs . . . your feet . . . totally relaxed. Repeat for two more breaths - or as is comfortable. Allow you mind to wander. You see before you a cave. golden light of the sacred creational flame. and experience the 'flow of creation'. . .
which is just below you as you enter the cave. the Source of the flame. as you pass through each flame / ray. Continue on receiving messages as you go.